So yesterday I started a new drug called adalimumab (Humira). I’ve been struggling to induce remission with my ulcerative colitis since 2015, with the past few months being particularly turbulent. I was put on another biological drug last January (2017) called vedlizumab, with infusions every 8 weeks. Unfortunately, this failed and being on a high dose of steroids (prednisolone) for some time now, my GI suggested moving treatment to Humira. As you may know from previous blog posts, this has had a detrimental effect on my running. I struggled with the Royal Parks Half in October, and things are not much better now. Being back on 40mg of prednisolone and the overall nature of the disease has left me feeling exhausted, but the motivation to get out there and run is always present. Okay, so my pace has been hampered- maintaining 8-minute miles (slower than my marathon pace) feels very tough right now, even for a 5k, so I’m hoping that the Humira works wonders… and quickly! So, what is this drug all about? Adalimumab, also known by its brand name Humira, is a humanised mono-clonal antibody that is administered subcutaneously. It acts by targeting a cell signalling molecule called Tumour Necrosis Factor-alpha (TNF-a), and as such, is referred to as anti-TNF-a treatment. TNF-a is an inflammatory cytokine that is produced during inflammatory conditions such as ulcerative colitis. Although it has a normal beneficial function within the immune system, over production in IBD patients is a contributory factor to disease pathogenesis. Simply put, this man-made antibody targets and attaches to TNF-a, thus preventing it from causing inflammation. 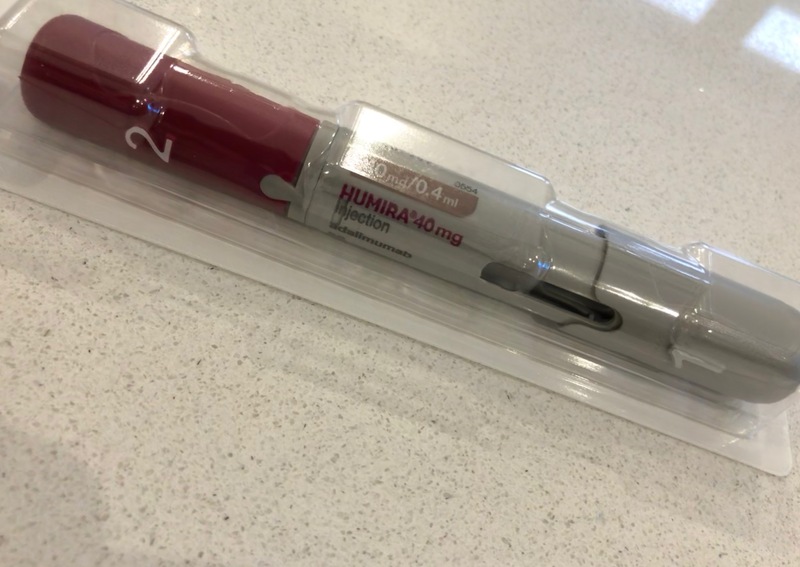 Another alternative biological TNF-a treatment is infliximab, but this must be administered intravenously in hospital every 4 weeks, so I decided to try Humira first, thus giving me more independence. Side effects range from the common and mild (fatigue, headaches) to the uncommon and severe (cancer, neuropathy, heart failure). It’s good practice to be aware and informed, but I’d rather not dwell on these too much! Now this is pretty interesting. St. Marks hospital referred me to start treatment, which is entirely handled by a company called ‘Healthcare at Home’. They contacted me a few weeks after my appointment in December (2017) and arranged to send the adalimumab to my home. On delivery, the drug needs to be stored in the refrigerator, and you get quite a lot of information in the form of a welcome pack, along with a sharps bin for the safe disposal of the syringes. A nurse then contacted me to come to my home to show me how to self-inject, as well as complete a lengthy amount of paper work and formalities. This was arranged for the same day I took delivery, so I could get started immediately. The needle itself is contained within a syringe pen, and the patient doesn’t actually see the needle (unless you take a peek inside from the bottom). I watched a few videos of people self-injecting and read a few forum posts beforehand. But needn’t had worried. The entire system was very easy, simple and pretty much pain-free. I had to inject four 40mg doses into my legs (2 on each side). This is to be followed up by a further two doses in 2 weeks time, then a single dose every 2 weeks. The syringe can be injected into the abdomen, but I preferred to do this in my leg. At £400 per injection, this stuff is not cheap. And knowing that I had just self-injected £1600 worth of medication within a few minutes was a surreal feeling! Post-injection, I felt pretty wiped out and tired for the rest of the evening. My running has already been hampered and I’ve been pretty tired due to a high dose of prednsiolone, but the Humira adds to this. I did manage to head out for a 6.5 mile run the following day (today actually!) and felt ‘okay’ for the first couple of miles before becoming rather fatigued. The pace was slower than usual, too. But in all honesty, I have become used to slower runs as I focus on getting better and enjoying other subtleties in life. Sending you lots of positive thoughts and hoping you will feel better very soon. Only just found this post and was wondering if/how the Humira has affected your running now you’ve been on it a while? I’ve had my first loading dose today and following a double injection in 2 weeks I go on to weekly injections (I have a different condition) and all I keep thinking is how is this going to affect my running?! I hope your condition has improved for you…. it’s a powerful drug so I’m hoping for some improvements considering the risks attached. Hi Nic, thanks for reaching out I’ve been on Humira for 9 months now and it seems to be working. Still on 10mg of prednisolone, but have seen a huge change. I am now on bi-weekely (every 2 weeks) injections. Exercise of course helps. Managed to get shorter distances back to speed, and got a 5k PB whilst on Humira, so running to your potential is definitely achievable (I believe) on Humira. But affects everyone differently I suppose. It’s a powerful drug like you say, and amazing if you don’t get any side effects. Feel free to send me a personal message/email if you want any more information- always happy to help a fellow runner! Hope it works for you as well. Great blog, I have Crohn’s and am a runner (distances from 5k to 50k currently). 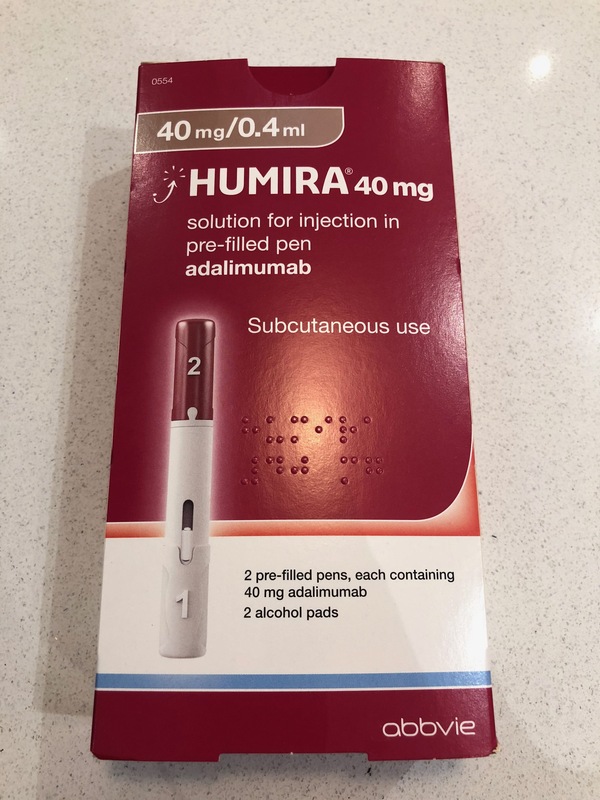 I am about to start Humira hopefully in a few weeks time, it is currently awaiting approval. I also have just come off a round of prednisone, which did tire me and slowed my paces down somewhat. Although having said that the Australian summer slows me down anyway. How are you going with longer distances on Humira? I am planning a half a full marathon and an ultra for this year. Hi James, thanks for your message. I’m still on 10mg of prednisolone along with 125mg azathioprine and the Humira. But am in remission. Should reduce the prednisolone soon. The azathioprine is a good drug to stay on as it helps prevent your body from producing antibodies against Humira itself. Awesome you are still running! It’s not easy, I know. I haven’t done many longer distances. Did Royal Parks in October in 1:28 which was better than I expected to be honest given how bad things were last year. I think I’d like to come off the prednisolone before attempting another marathon- linger runs (more than HM) don’t really suit me at the moment. Are you on Strava? Would really like to see how you get on with the marathon and ultra!